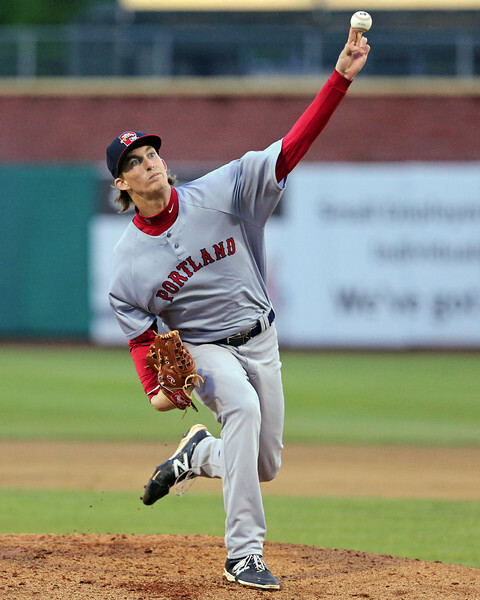 In this edition of The Write-Up, Chaz Fiorino provides a detailed scouting look at SoxProspects #3 prospect, Henry Owens. Stat line: 6.1 IP, 9 H, 2 ER, 1 BB, 6 K, 104-67 Pitches-Strikes. 16 swing-misses. Physical Description: Tall, lanky, long limbs. Huge hands and feet. Still has room for strength gains in legs and upper body. Arm/Delivery Mechanics: Semi-wind up. First-base side of the rubber. High 3/4 arm slot. Short arm action in back. Hands set at chest, drops hands and pulls back up in rhythm with delivery. Low-effort arm action/delivery. Hid the ball well generating deception. Comments: Sat 87-90, T92. Decent sink when down. Angle towards home plate from first-base side of the rubber. Played up with deception. Pitched to contact but reached back for 91-92 when needed. Fringe-average command with solid-average control. Was wild within the zone at times. Possible future plus offering with improved command and added velocity/physical strength gains. Comments: Long and loose. Late break. Needs to tighten up. Showed ability to throw for strikes. Future average with added velocity and tightness. Comments: Showed late drop and fade away from LHH. Consistent arm speed. Turned it over glove side on occasion. Showed confidence to throw in any count at any time. Great feel and control. Threw to both RHH/LHH. Complemented the fastball well and kept hitters off balance. Legitimate plus offering that played up a tick due to feel and control. Had great separation from the fastball. Comments: 19/30 first-pitch strikes. Consistently around the zone. Already made huge improvement this year. Nine straight starts with two or fewer walks. Summation: 24th career Double-A start. There is clear room for physical strength gains in both the legs and upper body. Owens has already put on at least 25 pounds since being drafted in 2011 out of high school, but having just turned 22 this week, and given his frame, I think there is still room for more. The biggest thing that has stood out this year with Owens is his recent improvement with his control. In Owens’s 236 2/3 minor league innings entering 2014, he walked 4.37 batters per nine innings. In 2014, over 112 innings, he has improved that mark to 3.29. His strides in this area give me comfort in projecting future average control from Owens. I was watching video of Owens from 2013 and noticed a slight mechanical adjustment in this most recent start which may play a part in his improved command/control. (Admittedly, this was my first look at Owens so I do not know when he made this change.) In 2013, Owens came set with his hands at his chest. He then left his hands at his chest as he went into his delivery. In this most recent start, Owens still came set with his hands at his chest, but now used a semi-wind up, beginning the delivery by dropping his hands to his belt and bringing them back up in one fluid motion. This slight change could give Owens a more fluid, rhythmic delivery, freeing up his hands and stiff upper half, and this may improve his ability to locate. Some pitchers will make the opposite adjustment where they go from the semi-wind up to no-wind up to eliminate moving parts in the delivery. However, every pitcher is different and I believe this slight change works for Owens; it has shown in the results. Given his age, frame, three-pitch mix, and make-up, I would safely project Owens as a middle-to-back end starter in the near future. But while I am most comfortable projecting Owens to fit this projection down the road, there’s still projection left if you want to dream on him as a future number low-end number two or above-average number three. The possibility of adding some strength and an uptick in velocity, improved sharpness to the curveball, and future potential average command mean Owens could reach that ceiling. Owens has said in interviews that he played around with a slider/cutter in high school. The organization had him shelve this pitch to focus on his other three pitches with the possibility of adding the pitch back later in development. The possibility of adding this pitch back in the future to give him a four-pitch mix could also boost his potential if he can develop the pitch into a serviceable offering. There is certainly precedent for this possibility as we’ve seen Anthony Ranaudo begin to incorporate a slider this year as well. The bottom line is that Owens needs a new challenge. He has nothing left to prove in Double-A. Unfortunately, that challenge will not come until there is room in the Pawtucket rotation, and there is none right now, although that could, should and will change shortly.